This recipe is perfect for these cold winter months and I love making galettes! 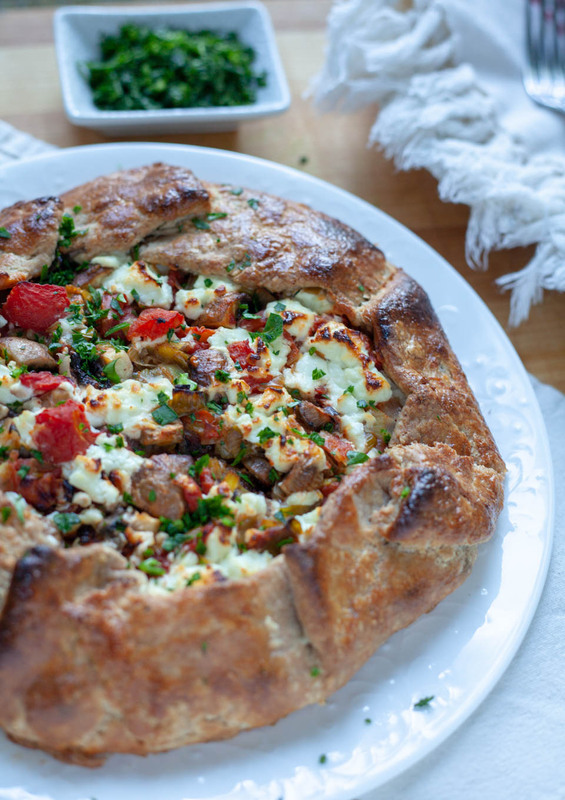 Adding herbs to the crust gives it a beautiful flavor and makes it taste like a fancy pizza. It’s easy to put together any day the week or serve for a family brunch on the weekend for something a little different. Serving it with a simple dressed arugula salad on the side is my favorite. While tomatoes are not in season obviously during the winter, using Muir Glen canned tomatoes is a must for me because I love tomatoes so much. Plus you can feel good about buying these tomatoes, they are organic, they work with the ecosystem by supporting pollinators. They also have a zero waste commitment to composting any tomato that is not fit for the canning product. I use them for quick cooked vegetable pasta sauces, traditional Pizza Margarita, tomato soup of course, and to add a beautiful sweet tomato taste to this galette. Which was a favorite of all the savory galettes I’ve made over the years. Win-win for all! 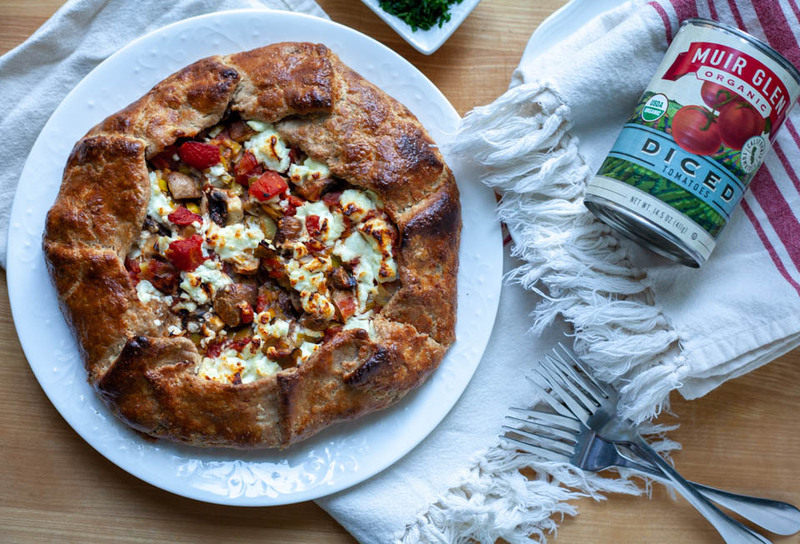 Plus, I think goat cheese and tomatoes are best friends. Muir Glen has partnered with Alberta Cooperative Grocery offering an awesome promotion in January, 10 for $10 for their 14.5oz tomatoes and in February a 2 for $4 for their 28oz tomatoes. So be sure to stop by and support your local co-op and stock up on your favorite tomatoes! It’s so easy to visit any of our local co-ops because there are so many in our great Portland area like the one I went to on Alberta. 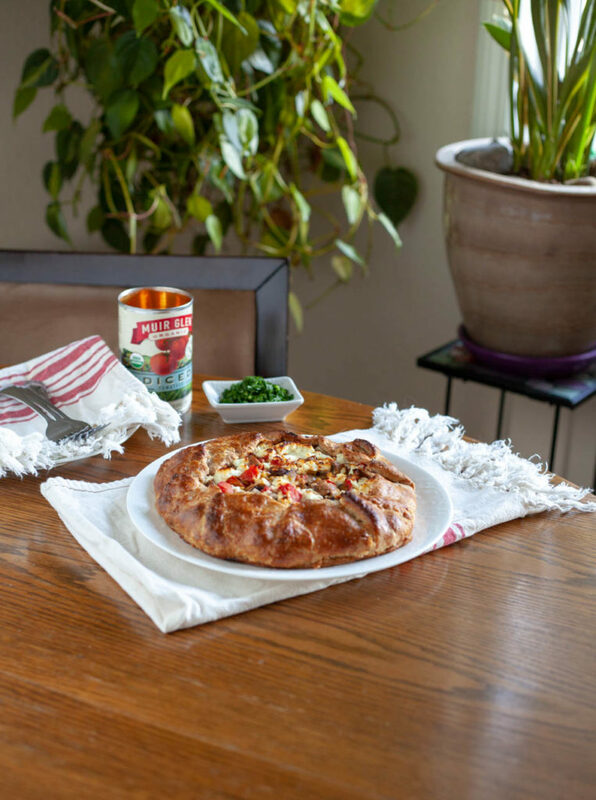 This mushroom leek tomato galette is a perfect dish for your weekend brunch or a weeknight meal for a tasty vegetarian option. Place oven rack in lower third of oven for best results, and to avoid a soggy dough bottom. Preheat oven to 400 degrees. Combine flour, salt, and thyme in a large bowl, whisk to combine. Add cold butter cubes, using your fingers, gently rub butter into flour mixture making pea sized chunks. Add cold water, and very gently mix using a spatula until a shaggy mixture is formed. Bring together gently in the bowl, fold over a few times to incorporate all of the butter and flour. Shape into a ball right in the bowl, cover, and place in fridge for 10-15 minutes. While the dough is resting, work on the filling. 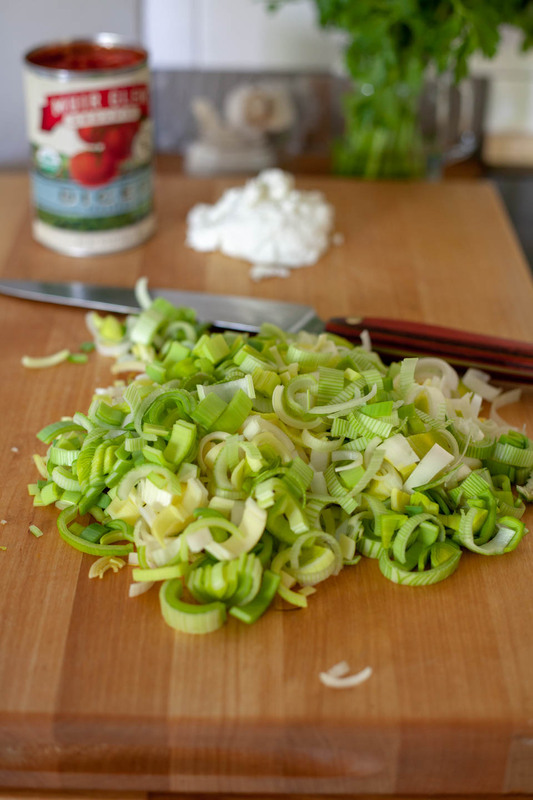 Add olive oil to a large skillet over medium low heat, add leeks, a pinch of salt, and cook for 5 to 7 minutes until softened. Add tomatoes, mushrooms, Dijon mustard, 1/4 teaspoon fine sea salt and fresh cracked black pepper to the skillet. Stir to combine, cook for 2-3 minutes, remove from heat. Remove the dough from refrigerator, place on lightly floured counter, roll out to 1/4 inch thick circle, about 12 inches in diameter. Place dough on parchment lined sheet pan. Place filling in the center of the circle leaving about 2-3 inches around crumble goat on top of filling. Fold the dough onto the filling. Using a pastry brush, brush on egg wash.
Place in oven and bake for about 40 minutes, or until crust is golden brown. Remove from oven and allow to cool for 10 minutes before slicing. Serve warm with fresh chopped parsley. Store leftovers in an airtight container in the fridge for up to 3 days. To warm, place in an oven toaster for a few minutes. Enjoy! Disclosure: This is a compensated post in collaboration with Muir Glen and TheFeedfeed As usual all opinions are my own. Thank you for supporting the brands that support NJB! 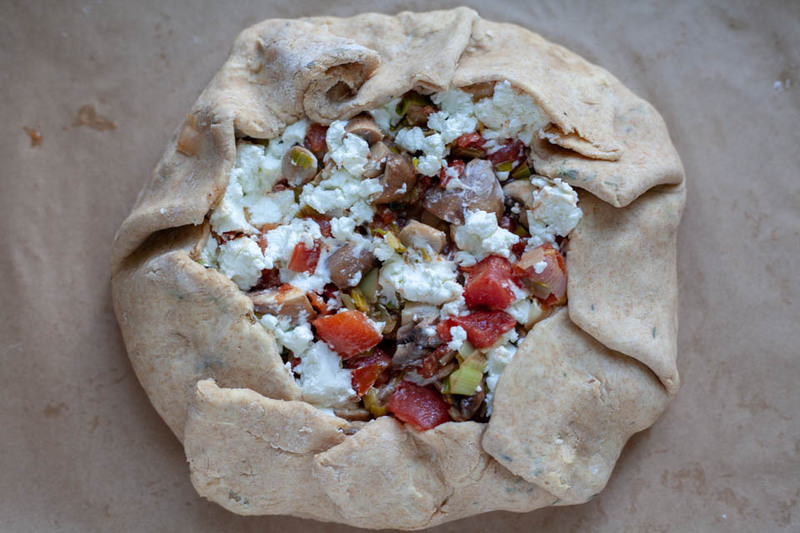 What a beautiful galette – LOVE the mushrooms and goat cheese!! Thank you so much! I love those flavors together :-). This looks to die for! So creative and probably even more delicious! Now this looks fabulous. I’d eat this any time over something sweet!!! Thank you! It’s a great one to add to the rotation.